Navigating the world of content marketing can be confusing. The path from marketer to consumer is a vast ocean of ad agencies, social media sites, content creators, syndicators, aggregators, and search engines. In an effort to gain a bird’s-eye view of the situation, content marketing firm Studio One created one single chart to rule them all. In the same manner as LUMA Partners‘ exceedingly complex e-commerce chart, Studio One arranged all the major players in content marketing by their specialty and position relative to the consumer. 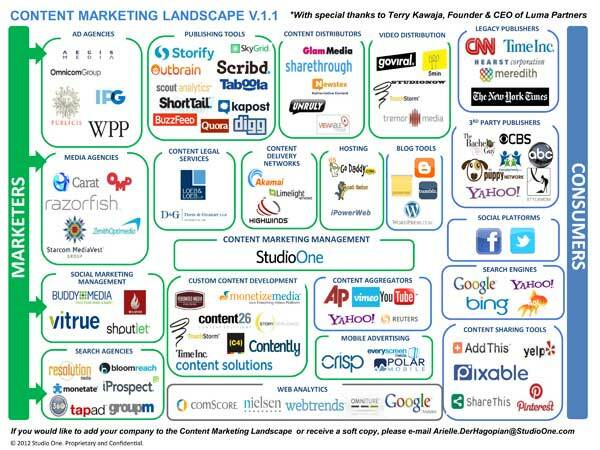 Behold: the content marketing landscape (click for larger version). Courtesy of Studio One. As a content creator, content26 is nestled within the custom content development section of the chart. Though only a small section of the content marketing landscape, content26’s services are a critical foundation to any successful marketing strategy. As commerce moves increasingly into the digital world, the product detail page becomes your “digital box”; that is, the digital version of your product’s physical packaging. It is here that consumers compare products and learn about features—and it is here that content26 offers its expertise in creating compelling content for your business. Special thanks to Studio One for including content26 in their project. For more information on content development and content26’s services, check out our website.